In order to quickly provide sampling data related to uniquely barcoded items, this program was devised. In the past, people sampling data would find barcoded items that they needed, write down the respective numbers (which may be written down incorrectly) of such, and/or take pictures of the barcodes (which may not be properly focused). The numbers would then be manually typed (sometimes incorrectly) into a program for analysis a day or two later in order to determine if there were any bottlenecks when going from one location to the next. This program is designed to speed up that data collection methodology. The eMail address line references the phone’s internal list of contacts for quickly populating the field. Additional comments, related to the scans, may also be put in the comments section. This may include info on associated data. When the Scan Barcode button is selected, it calls the Team ZXing Barcode Scanner, a popular free scanner app on the market with 400 million downloads and which is also required, with which it interfaces. The scanning number is then shown in the associated text box, which can be modified at the user’s discretion. After ensuring that the scan was completed, the user would then select the Add to List button, which will include it in the existing list of barcodes and increment the label list by 1. The Delete button removes the barcode. Pressing the Configure button will take you to another screen. This screen allows you to change the default delimiter to a space, new line, semicolon, or keep it as a comma. The New Line option is very useful when pasting the data into other applications such as Excel for automatic analysis; or the comma for direct insertion into user-specific programs such as PTS-2. You can also provide an addition to the Subject header of the email that will be shown in your email. (By default, the subject header will say, “Last Scan @ [time~H:MM:SS AM/PM mmm-d-yyyy].” Simply type in text in the Email Subject textbox for it to appear alongside the default subject header, which may be useful for segregating emails for different samples. ... my contacts? This device allows you to quickly pull a contact from your email list for emailing the data. It is done to save you time. If you don’t see the name when typing in the first few letters of the email name (and it’s in your phone’s list), try turning your phone sideways, as your phone’s auto-keyboard may be hiding the name. It wants to be able to access your contacts for that reason alone. It does not use them for any other purpose. ... my SD card? The device needs to temporarily store the data, before compiling it inside your email. That is the sole reason why it is kept there. ... my wi-fi settings? When scanning QR codes, they can encode the user name, password, etc. for a wi-fi network so that you don't have to type them into your phone. To do this, the application needs to be able to change wi-fi settings. When a text is received, TextMaster can automatically provide a default text response. It also has the OPTION of automatically providing the current location of wherever you're located to the sender of a text in a linked text response. Another option that it has is that it will speak the received text aloud so that you don't need to view the text. 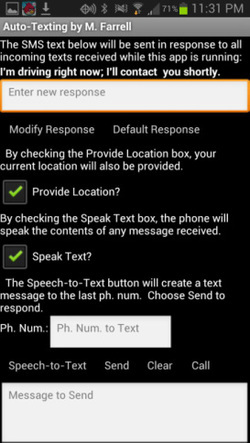 It can also handle voice dictation, thus converting your speech to text, which can be automatically sent to the last number of a text received (or changed if necessary). It requires SMS and GPS to be in use, and may use data when activated, interfacing with Google Maps for data and GPS capability. It's currently in use on my Android Samsung Galaxy S3. It's a work-in-progress and is not available on the Google Play Store yet. However, you can download it for free at the link below. By doing so, however, it requires you to allow third-party programs from your settings. If you experience any issues, let me know through the Contact form here. CincyAttractions.apk - for finding things to do in the Cincinnati area (uses GPS and data plan). StockQuotes.apk - for quickly finding stock quotes. Just put in the 4-digit letter association of the stock, and instantly find the given stock price (uses data). Default is GOOG (Google). Do you have a friend who always likes to play pranks on you, or perhaps know of someone who is slightly annoying, and you want to play a joke on them? For a small fee, you can have a customized app made similar to mole mash, with the person's head (from a picture that you provide) jumping all over the screen; and, when you put your thumb on their face, the person says, "Ouch!" - and you get a point! To understand how this works, see, for example, the Android app SmashBikes.apk, which I developed for one of the other websites that I put together for Brush Creek Cycles. Use the Contact link here for more info.